The use of a traditional River Tay 16ft coble salmon fishing boat on the Tay offers several distinct salmon fishing advantages on big rivers where there are often an abundance of long distance salmon lies. A skilled boatman on the Tay or any Scottish salmon river will handle his boating techniques with absolute perfection even though on the majority of occasions you'll not even be aware of his concentration levels. A real Tay boatman will use the minimum energy required on the outboard while navigating upstream and downstream with no bow wave commotion that could move salmon off their lies. Watching a true master boatman is an education in itself and I was fortunate as a young man to have such guidance from a master Tay ghillie the late Willie Laird. In the old days you'd have had 2 men on the oars all day when harling was required and what a long strenuous day that would have been before the outboard era made life easy for the boatmen. A boat can be used as a casting platform where a professional boatman or ghillie will rope you down through the pools while you cast a consistent length of line as he's doing so. It can also be used for traditional River Tay harling where lures or flies are swung methodically behind the boat as it slowly works in a downstream direction. The boat can also be utilised as an upstream or downstream trolling approach and especially for utilising commuting time from one area of the river to the next fishing location if your boatman is sharp enough and often a fish or two can be accounted for by maximising these little daily river journeys. With harling the proper technique involves having your lures or flies staggered at different ranges with the middle rod of typically 3 (poker rod) fishing the longest line. The correct River Tay harling approach is to drop the boat back downstream one boat length between each turn of the boat. This requires focus from the ghillie or boatman and if he's engaged in conversation with his guests he'll be operating on peripheral vision and his concentration will be hardly noticeable. 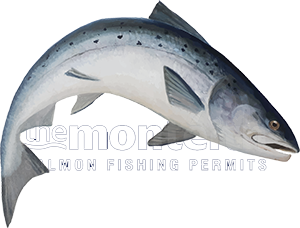 On the slower moving beats or in low water conditions I've seen various methods of trolling upstream produce the goods and a slow upstream zig zag style of approach can be deadly at any time of year if you know salmon are present in the pool. A day out on the Tay in the boat is a fantastic way to approach the salmon lies and it really scores well by allowing the salmon fisher to control the pace of their salmon fly over the salmon lies whereas a long line fished from the riverbank over long distant lies will be difficult to control. Treat yourself to a River Tay salmon boat fishing experience and observe the tact and skill of an expert Tay boatman and how he goes about his daily boating duties.